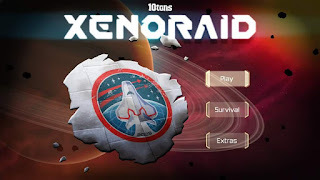 Xenoraid is yet another game, like Dragonball Xenoverse 2 and Fire Emblem Warriors that took me out of my comfort zone to review. Most notably, it's because I've avoided many shmups for the last decade of my gaming life. Why? You may ask... It's because I didn't feel that the genre had any new experiences to offer me. Every new one that I did try, no matter how lauded and recommend, always ended up feeling like one if the many shmup classics that I grew up playing. While I still find their gameplay fun and engaging, that engagement usually tended to last for around 20 minutes, maximum. Even when I was a kid, I got the most enjoyment out of the varied genre in short bursts that lasted the length of a few quarters/tokens on an arcade machine while I was awaiting a turn on fighting games, beat 'em ups, and cockpit racers. Then, something beautiful happened. 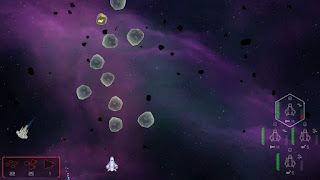 I received a review code for Xenoraid from indie developer 10 tons, and Xenoraid immediately grabbed my attention. It started off with a standard story- there was an incoming wave of alien invaders that I needed to ward off using my flight crew of four. Immediately after jumping in, I noticed that there was a little section on the right side of the heads up display that was aligned in a diamond pattern which matched up with the ABXY face buttons. I could swap between these four ships with a button press, and each of them had distinct bullet patterns and rocket types with which I could blast the baddies. Figuring out the best strategy in which to deploy any given ship to maximize my presence on the battlefield gave the game a whole new level of depth that I found lacking in many other shmups. 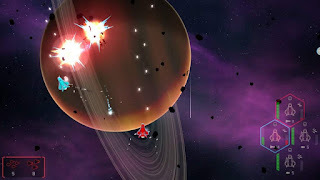 In addition to this cool little feature, you gain credits as you shoot down enemy ships and blow up specific asteroids. You use these credits to repair your ships in between missions, and these same credits give you access to new upgrades for your ships that can be one time use or permanent upgrades. 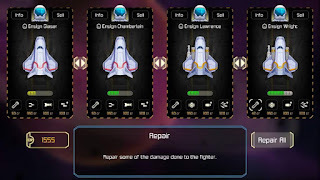 The difficulty in the missions themselves builds at a comfortable place as you progress, but there is an added level of difficulty due to the repair and upgrade process because if you lose a ship on a mission, you have to buy a new ship(s) to replace your fallen allies. This leads to some very interesting decisions about whether you want to upgrade your existing ships to make the next mission more easily manageble, or hold back credits to buy replacements if it gets too hairy. My advice for the first little while is to just repair your ships in between missions for a safety net to fall back on if you do lose a ship or two before doing upgrades. Your crew members also gain rank as they survive each mission, and this increases your credits earned and there is one upgrade that you can get early on to retain a certain portion of the credits they've earned in mission if they're blown up, and this is possibly one of the most important upgrades to get early on. 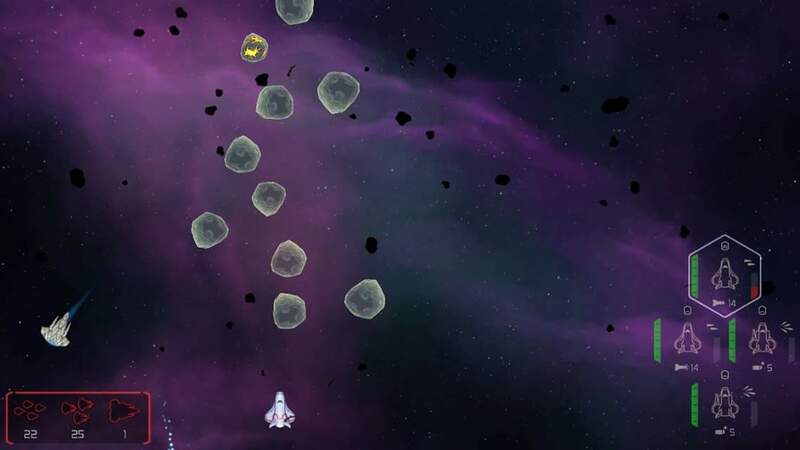 The game also boasts a local co-op mode that adds one extra ship on screen at once to help you better manage the waves of enemies. The extra firepower really helps, but it does limit your options on which ships are available to you at any given moment. I enlisted my eldest to assist me in my mission to stave off the extraterrestrial horde, and she provided me with great counsel like reminders to not just rapid fire without enemies on screen so that I don't overheat. This is another great example of what makes the Nintendo Switch an ideal machine for friends and families alike to jump right in and game together, just like the good old days. Even if you're not usually a fan of shmups, Xenoraid has a lot to offer. If you are a fan of shmups...what are you still doing here? Click that link below and treat yourself!